His wife served a wonderful lunch with several courses. It made me nervous that she didn't set a place for herself and sit down, but maybe that is the way they do it here. Their apartment is lovely. It is on the 10th floor of an apartment building. Brother Batbold has decorated it beautifully. The apartment has an American style kitchen with lots of counter space. He and his son did all of the work themselves. The elevator in the building wasn't working. They had to carry all of the building materials and furniture and appliances up 10 flights of stairs. They ordered all the furniture, wallpaper, kitchen cupboards, and appliances from China. 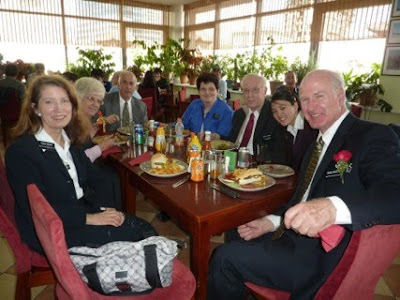 Gloria Wheeler returned to Mongolia on Tues. Oct. 13 for about 2 months. She is working with the university here in Mongolia, where she taught last year on a Fulbright scholarship, to get it accredited by a U.S. accrediting agency. On Thurs. Oct. 15 Wes and I had the opportunity to attend a meeting of the 1st Khoroo (a neighborhood group) and tell about the DIC programs (wheelchair, wells, neo-natal resuscitation, and vision) and present a boy with a wheelchair. I was impressed with this group which was trying hard to help people in their own khoroo with their special needs. The weekend of Oct. 17/18 was the first stake conference of the UB West Stake since its organization last June 7th. It was an Asia Area broadcast covering 17 stakes and 16 districts. I really enjoyed the broadcast. Two weeks in a row I was able to hear messages in English (General Conference and then this area broadcast). The speakers were Elder Watson of the Asia Area presidency, Sister Dalton of the YW presidency, Elder Oaks, and President Uchtdorf. Sister Dalton spoke on obeying with exactness. Elder Oaks spoke on the unique features of the Church. 1) The Church was established by Jesus Christ. 2) The Church contains the fulness of his doctrine. The central message is the atonement of Jesus Christ; the Book of Mormon is a 2nd witness or testimony of Christ and his atonement. 3) The Church has the power of the priesthood. We have a prophet who has the keys for revelation for the entire Church. The Church is restored Christianity. President Uchtdorf spoke on many subjects. He said the Church is united despite political boundaries. We're united in our testimony of Jesus Christ. We are never alone in the Church. Just as it's been said, it takes a village to raise a child, the Church is like a world-wide village. We help and strengthen each other. He said he was grateful for members' prayers and dedication to the Church. This is a strength to the Church and to the communities in which the members live. He spoke to the young men. He told them the Lord has a work for them to do. They are to prepare. They are to study Preach My Gospel, particularly chapter 3. They are to read, ponder, and pray. Preach My Gospel should be used for family home evening. 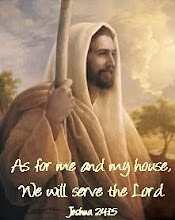 They are to decide now to go on a mission and to commit themselves to Heavenly Father. There are many good people to be loved and invited so they are no more strangers. This is a great and marvelous work, a modern miracle. Ask yourself what am I doing to a) increase my faith and b) strengthen my marriage and family. Prayerfully reflect and ask the Spirit to guide you. Listen to the Spirit. The promptings of the Spirit will be specific to you. The Lord has promised you will be taught from on high if ready according to the Lord's timetable. You must follow the promptings you receive. It is hard to focus on what is most essential. Life is distracting. Set goals in terms of outcomes. The gospel of Jesus Christ will give you a clear focus. Evaluate where you are in your journey back to your Heavenly Father. Where do you need course correction? Always share the gospel message with family, friends, and neighbors. In Romans 1:16 the Apostle Paul said "For I am not ashamed of the gospel of Christ: for it is the power of God unto salvation to every one that believeth." Your testimony becomes stronger by sharing it. Share your joy with your spouse and your children. Set a good example for your family. Labor diligently for your and your family's conversion. 1) Hold a current temple recommend. 2) Study the word of God daily. 3) Speak with your Father in prayer daily. On Saturday Oct. 24th we had a farewell party for the Andersons. They left on the morning of Wed. Oct. 28. It was sad to see them go. They're a wonderful couple. Dr. Anderson was continually kept busy with the medical needs of the mission and other people who needed care. Sister Anderson was continually involved in doing good to others. We are still having a problem getting visas for new missionaries to come in from the states. We have 3 couples and 13 young missionaries waiting to come. This Sunday will be a fast by the missionaries to soften the hearts of government officials so we can get visas for the waiting missionaries. Family, we'd like you to join with us this Sunday in fasting and praying for the visas as well as for Wendy Rae and Travis. A couple, the Whitmans, serving a mission in Hong Kong, arrived the same afternoon on Wed. Oct. 28 to help in this mission for a month. They came under a tourist visa. Elder Whitman was a former dean at the B.Y.U. Law School. He will be helping Soyolmaa work on the legal aspects of the visa problem. His wife Sister Whitman is a nurse. She is stepping in to fill the gap left by the release of Elder Anderson. Today was her first day in the office and she was busy all day with medical problems. Monday evening was our evening to go out and help with the singles family home evening. The youth teach the lesson and conduct the games themselves. All we do is provide refreshments. We brought chocolate cupcakes and served the remainder for Addiction Recovery on Tuesday night. In Addiction Recovery it was step 2 (hope) of the 12 Step program. We had 10 people in attendance besides the staff. Thursday night for English, since it's close to Halloween and they know something about it, we did some Halloween activities and again had cupcakes, this time with orange frosting. Saturday morning (Oct. 31) will be transfer day again for the missionaries. Supposedly it is a small transfer, but there will be a lot of changes. Since the American missionaries haven't arrived, some proselyting areas will be temporarily closed down. This video was shown on TV sometime in the past to make fun of Mormon missionaries. Chinggis Khan had a pair of 2 white horses. Since the missionaries are often white and they go everywhere together, they are called Chinggis Khan's 2 white horses. The music accompanying the video is the music the Mongolians sing when they refer to the Mormon missionaries as Chinggis Khan's 2 white horses. To illustrate the importance of basic human rights in other countries, I refer to some recent history in Mongolia, which shows that the religious freedom we have taken for granted in the United States must be won by dangerous sacrifice in some other nations. Following the perestroika movement in the Soviet Union, popular demonstrations in Mongolia forced the Communist government to resign in March 1990. Other political parties were legalized, but the first Mongolian elections gave the Communists a majority in the new parliament, and the old repressive attitudes persisted in all government departments. The full functioning of a democratic process and the full enjoyment of the people’s needed freedoms do not occur without a struggle. In Mongolia, the freedoms of speech, press and religion — a principal feature of the inspired United States Constitution — remained unfulfilled. In that precarious environment, a 42-year-old married woman, Oyun Altangerel, a department head in the state library, courageously took some actions that would prove historic. Acting against official pressure, she organized a “Democratic Association Branch Council.” This 12-member group, the first of its kind, spoke out for democracy and proposed that state employees have the freedoms of worship, belief and expression, including the right to belong to a political party of their choice. When Oyun and others were fired from their state employment, Oyun began a hunger strike in the state library. Within three hours she was joined by 20 others, mostly women, and their hunger strike, which continued for five days, became a public demonstration that took their grievances to the people of Mongolia. This demonstration, backed by major democratic movement leaders, encouraged other government employees to organize similar democratic councils. These dangerous actions expanded into a national anti-government movement that voiced powerful support for the basic human freedoms of speech, press and religion. 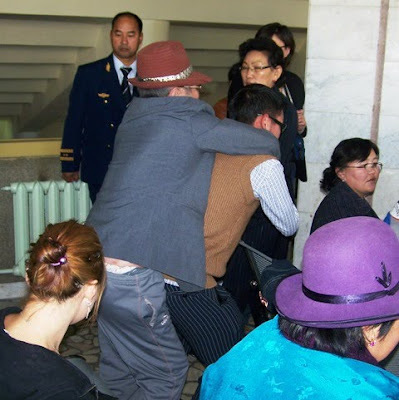 Eventually the government accepted the demands, and in the adoption of a democratic constitution two years later Mongolia took a major step toward a free society. [iii] The information about events in Mongolia was obtained from correspondence with President Odgerel and from Mary N. Cook, former senior missionary and wife of Richard E. Cook, the first mission president in Mongolia. A lot of the events recently have involved other senior couples in UB although we only have four couples left in UB now, plus the President and his wife. The Lassons are in charge of Deseret International Charities and also English teaching until the new couple arrives. The Caldwells are in charge of Employment Resources. Dr. and Sister Anderson are over medical care, but will be leaving soon. We’re the Office Administrators. 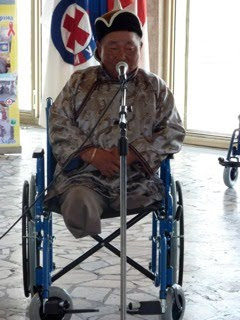 On Tuesday September 29th there was a wheelchair ceremony at the Children’s Center under the joint sponsorship of the Red Cross and Deseret International Charities. Deseret International Charities is the Church’s humanitarian organization. In fact the Church is in Mongolia under the Deseret International Charities charter. 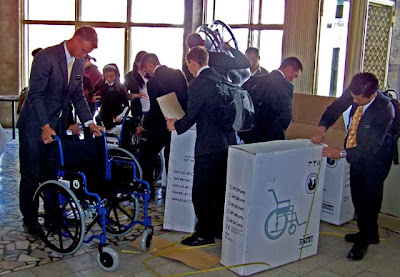 Although both groups sponsored the event, the wheelchairs came from the Church. 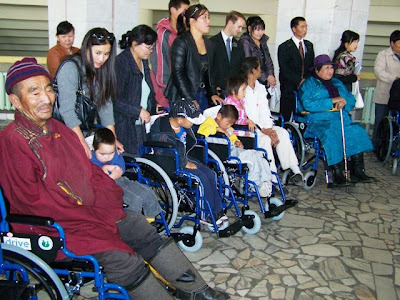 The Church sent an order for 750 wheelchairs to be distributed here in Mongolia. Elder and Sister Lasson are the DIC country directors and were in charge of the program. We went to the ceremony with the Lassons and Caldwells. There is a great need for medical care here. The missionaries were involved in unloading the wheelchairs and putting the wheelchairs in storage at the Red Cross and also at the Khan-Uul church building. Then a district of missionaries came to the ceremony to help set up the wheelchairs and to put people into the wheelchairs. Some people were carried in to the ceremony by family members. 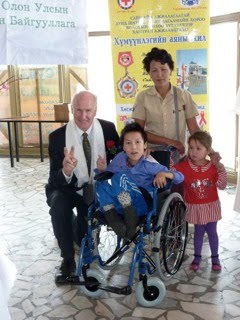 See http://makingmemoriesinmongolia.blogspot.com/2009/10/wheelchair-for-homeless-man.html about one man's need for a wheelchair. Alcoholism is a blight here in Mongolia. We're involved in addiction recovery which is a very needed program. Tuesday afternoon we'll meet with the governor's office from our khoroo to tell about our addiction recovery program. After the ceremony we went to Millie’s for lunch, a restaurant which serves American food. The following evening we went to dinner at the Caldwells and had the opportunity to visit with them. On Saturday October 3rd we went to a performance of the Khoomei-Taiko Ensemble at a theater in the Khaan Bank with the Lassons and Caldwells. It was a program combining Mongolian and Japanese music. It was interesting, but I prefer programs with just Mongolian music. A lady played a Japanese koto who was very good. On Sunday October 4th Elder and Sister Stroud who were CES missionaries in Mongolia a year ago gave a fireside. In Mongolia all you have to do is to announce a fireside in the morning at Church, and the room will be packed with people for the fireside in the evening. The Strouds came back for a sealing at the Swiss Temple of Richard Huy from Germany and his wife Baagi. Tuesday October 6th was Zone Conference. The theme was “Enduring to the End,” and again we were prepared in case we were called on to speak. The President’s birthday was on Sunday October 4th. We decided to surprise him with a birthday breakfast on Wednesday October 7th. It was a very nice breakfast, but I am not sure a surprise is such a good idea. His wife told him there was an emergency downstairs, and he went barreling down the stairs with his heart pumping. When he walked into the room, we yelled Happy Birthday. I think it took a while for his heart to settle down. There are many emergencies in our mission. When he got back upstairs from the breakfast, he found that a missionary had jumped out of his second story apartment window and broken his foot. We really enjoyed watching all of the sessions of Conference. Yesterday Sister Caldwell made cinnamon rolls during the Priesthood session. We enjoyed them together after Priesthood meeting. Today between sessions we had a potluck dinner with wonderful food. For me there seemed to be two main themes to the Conference: 1) learn to receive personal revelation and follow the promptings of the Spirit, and 2) love God with all your heart and love your neighbor as yourself. Then there was Elder Holland's strong talk on the Book of Mormon.